Okra chips by the sea. I was about 5 the year I found a junk food oasis on the beach. My extended family was on vacation at Holden Beach on the North Carolina coast, a trip we make most summers, when my mom and I took an overly ambitious trek down the island. She'd given birth to my little brother only a few weeks before and thought a nice long walk would help burn off some baby weight. We made it a good ways from our rented house when mom got faint — maybe too soon for a post-baby beach marathon — and our beloved stretch of sand took on an ominous resemblance to the Sahara desert. That's when the oasis appeared. A massive Indian family (in number, not girth) was having a party under a few small tents on the beach (huge, magnificent tents to a five-year-old!!). We dragged our hot, sandy, dehydrated selves over to ask for a drink. There were probably some wonderful Indian delicacies on the loaded buffet tables I could have tasted for the first time, but my wide eyes zeroed in on the Oreos and Cheetos — both verboten in my hippie household. As I munched away happily on my forbidden junk food and made a few new friends, a generous mustachioed man took pity on us and offered to drive us back down the beach. We were ushered into a grand air-conditioned beach house — they had a coffee table filled with shiny shells and a maid (in a uniform!) — and driven home. Fast-forward 25 years to the same beach this week, and I thankfully no longer see Cheetos and Oreos as the epitome of desirable snacking. (I also bring water on long beach walks.) I've found a new favorite beach junk food: okra chips. My aunt brought us two boxes of the crunchy, salty snacks, which get that way from being vacuum fried. Okra lovers will marvel that there's still a slime factor under all the crispness. Okra haters, well, you wouldn't probably eat 'em anyway. And though I'll always fondly remember our kind saviors, their fancy house and the Oreos and Cheetos, I'm happy to have a new, more wholesome junk food sitting by my beach chair. And it's really amazing that the slime sticks through all that dehydration. I often put pickled okra in my martinis in lieu of olives, crisp, not slimy! 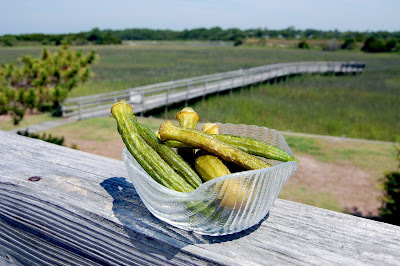 Pickled okra is also a great garnish for a Bloody Mary, similar to how they use pickled spiced string beans in the Bloodies at the Columns Hotel in New Orleans. Amanda, any idea what they are friend in? Thanks! After reading this, my mom reminded me that there was also orange Fanta. How could I forget! Brett- Canola oil. The Fresh Market where they came from says: "Our Okra Chips taste just like southern fried okra! Really! The okra is vacuum fried (resulting in less fat than traditional frying methods) and lightly salted for the ultimate snacking sensation! Our Okra Chips are a new product and quickly becoming a customer favorite."